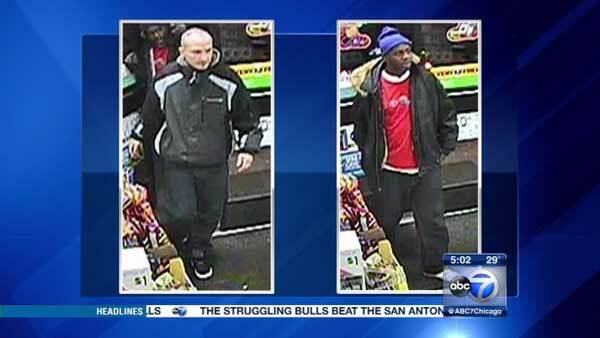 CHICAGO (WLS) -- Police released surveillance photos of two men suspected in convenience store robberies on Chicago's Northwest Side. Authorities said four robberies occurred in the last month: one in the 6800-block of West North Avenue around 3:20 a.m. on Dec. 7, one in the 2700-block of West Harlem Avenue around 9:12 p.m. on Jan. 3 and two in the 2900-block of North Pulaksi Road - one around 1:25 p.m. on Jan. 8 and the other around 9:40 a.m. on Jan. 13. Two men were caught on camera when the 7-Eleven near Harlem and Diversey avenues was robbed. They are also suspected in the robbery on North Avenue. One suspect is described as a Caucasian man in his late 20s to mid 30s, between 5 ft. 10 in. and 6 ft. 1 in. tall and around 170-190 lbs. He was wearing a black hooded sweatshirt and black jeans. The other suspect is described as an African American man with a dark complexion in his early to mid 30s, between 5 ft. 10 in. and 6 ft. 2 in. tall and around 220-250 lbs. He was wearing a black jacket with a fur-lined collar and black jeans. The suspect in the incidents on Pulaski Road is described as a Caucasian man in his 20s with blonde hair, about 5 ft. 8 or 5 ft. 9 in. tall and 175 lbs. He was wearing a partial face mask, a green hooded jacket and blue jeans. Police said the suspect was armed with a dark-colored handgun. Anyone with information regarding these robberies should contact Area North detectives at (312)744-8263.